A big thanks to the Dodger PR group for passing along these photos of some celebrity sightings at the Dodger game yesterday afternoon. Comedian George Lopez threw out the first pitch and Ian Ziering was spotted in the crowd. As the year comes quickly to a close I started to wonder if any new finds might pop up. 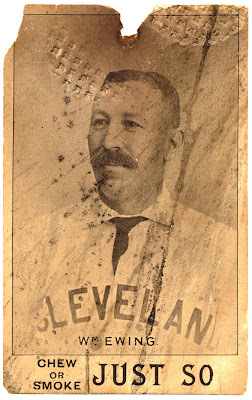 Well, no sooner said than done, we get a one-of-a-kind find of a 1893 Baseball card. Actually, it was originally found in the 90's, but remained unknown to hobby experts until recently. One afternoon, Mike Gazo went to work on his Moms bathroom. A typical remodel job for a do-it-yourself handyman. As he tore down the walls he discovered something unusual. The above Just So Tobacco card of Hall of Famer Buck Ewing was nailed to a crossbeam. It was an unusual find for the casual collector that he was. He had no idea what it was or knew who this person was staring back at him. He took it home and casually showed off to friends for over a decade. "I just thought it was a cool card," he recalled. "I wasn't much for the internet back then so I just took it around. Had it in the glove box of my car. I showed it to a few local collector friends and some dealers but they didn't seem to know much about it. They thought it might be worth $100 or so. I kept it in my sock drawer. Sometimes it sat on my coffee table. My friends who collected when I did used to be amazed when we ran across something like a 1960 Willie Mays. We never had any tobacco cards." Little did he know that he found an extreme rarity hobby experts wondered even existed. The Just So Tobacco set is one of the scarcest ones around. Only discovered in the 60's, few examples have lasted the test of time. Mike's card is an original and this particular player had never been seen before. Only 15 different cards are known (now 16), and it is believed more exist. Most cards have only a single example. Unfortunately, a complete checklist may never be known. It will be auctioned next year in REA's next auction and may reach into the high five figures. Click the below links for even more detail on this incredible find. 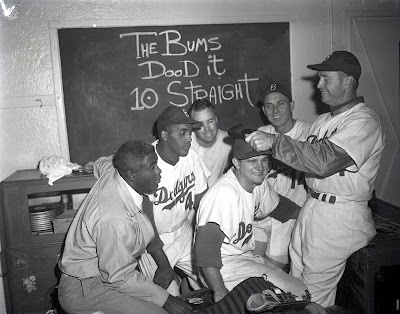 Here is my second follow up to my recent post featuring Dodger pics from Legendary Auctions current photo auction. There are so many great photos, I couldn't keep it to just one post. Check them out below. 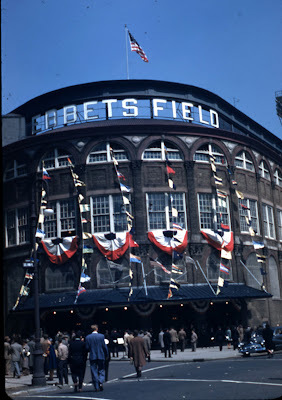 The Ebbets Field facade in color. 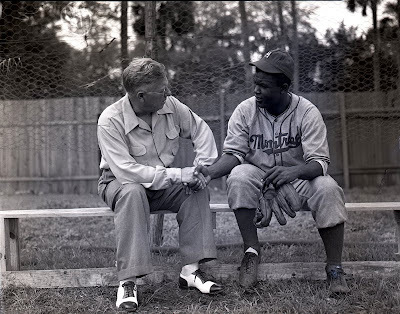 Baseball pioneer Branch Rickey with Jackie Robinson. 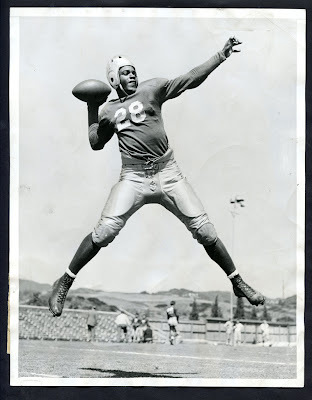 Here is Jackie in a very familiar football pose. I think this is one of the better photos in the auction. The Brooklyn Bums took ten straight. They Dood it! 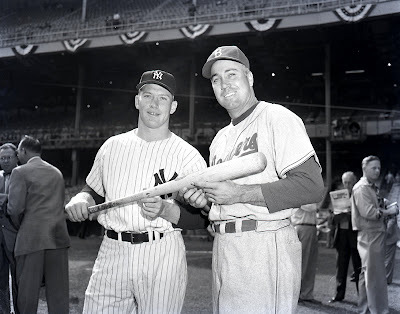 I recognize Jackie Robinson, Joe Black, Duke Snider, Gil Hodges and Walter Alston, but who is the guy in the middle with the giant smile? 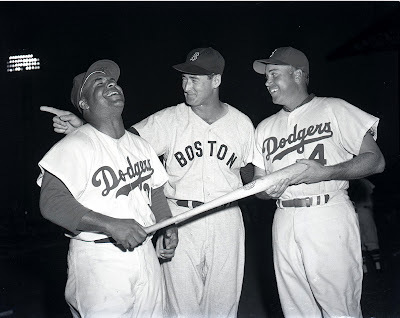 Here is a great shot of Ted Williams joking around with Roy Campanella and Duke Snider. We are only missing the Giant. Especially Willie, Mickey and The Duke. This photo is hilarious. 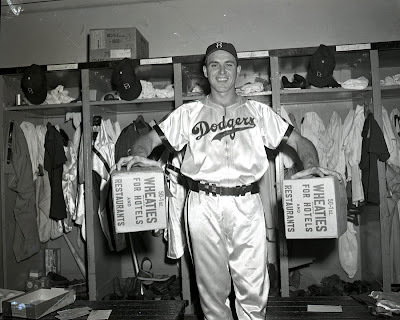 Gil Hodges lifts a couple boxes of Wheaties while donning those shiny satin Dodger uniforms from 1948. 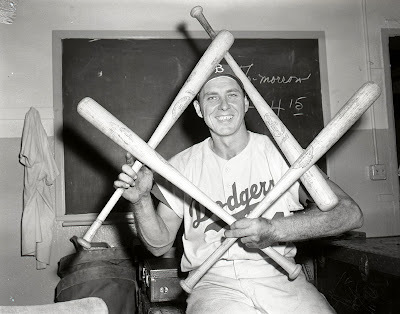 Gil Hodges is framed just right.